Wow, sometimes you have polishes on your wishlist but after a while, you kinda forget about them. Well, Manon just reminded me I still need Zoya Dream :D! What a beauty ♥. Isn't this dark green shimmery beauty just perfect? It's named Free-Spirit Of The Season and one out of 3 shades from this little collection. Check the link for the other 2 beauties! Twice a year Catrice updates their core collection - releasing new polishes that always need my attention ;-). Last year one of them was Inner Purple Of Trust, a crelly like midtone purple. I have 2 new shades released this year waiting to be swatched for you guys! Blue holo's, aren't they just the best? 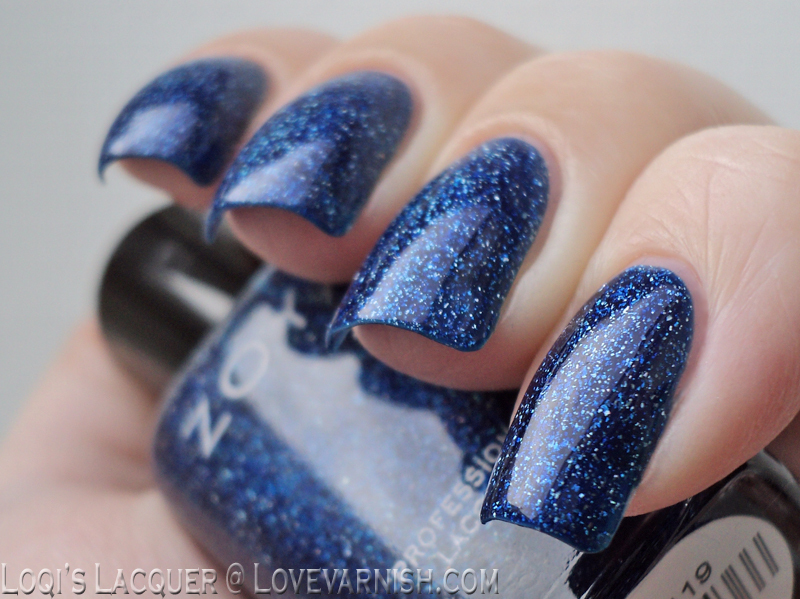 This beauty from NailNation3000 has extra glitter added for that bit of oomph you see up here. Glorious! The blue is kinda overpowering this week, huh ^^? To finish this list, let's take a moment to look back on this lovely mermaid like texture. I bought it in Poland, and I'll be going there again in May, I'll definitely check out this brand some more! Hope you try it soon, it's a fun little brush! Thank you so much! A rich fabric, that's a really nice thing to compare it to :). Thanks Miriam, ik was er zelf ook erg blij mee :). All are beautiful! I seriously can't get over how beautiful your swatches are! As soon as I saw that first photo i thought "Why in the world do I still not have Dream? It's been on my wishlist forever." Haha. I fall in love with Dream all over again every time I see it! Ahh all the blues are just to die for! I don't think I can pick a favorite...and then even that Hare polish is calling my name! Beautiful, I don't even think I can pick a favorite here! Ohhhh, so many amazing blue polishes!! I'm in love haha! That Hare Polish is really pretty too! What a great week of posts! I love that Catrice shade!